A tropical paradise chock full of great food, breathtaking views, and incredible celebrations, it is no surprise that Thailand is a sought-after destination! Those who have visited bring back wonderful stories to tell, and lessons learned along the way. From research and personal experiences, I present to you a comprehensive list of vital items needed on an adventure to Thailand. This minimal packing checklist will help you simplify your packing for a lightweight, organized, and enjoyable trip to Thailand. There is an element to minimally packing that hinges on your plans while visiting Thailand. Many celebrations in Thailand will require special attire, and thus, extra planning on your part. If you have the chance attend one of the celebrations below, make certain to pack the appropriate items if you wish to join in on the festivities. The Thai’s New Year celebration is known as the national holiday of Songkran. This event is unlike any festivity I’ve seen. Everyone partakes in a huge water fight in the streets. The second week in April the water wars take place. To prepare for the merriments, bring dark colored clothing, which will dry quickly. Goggles are also a must, as errant water gun squirts will inevitably hit your face. Bring along a water proof bag, as well as additional waterproof cases for electronics. You will most likely be soaked, even if you are just in the vicinity of the celebration. Join in on the fun and take nothing personally in the water war! This three-day celebration is a colorful display of the culture and mysticism in the area. The origin of the festival is a recreation of a story where a party was so monumental that both living and dead attended. Visitors have the option to dress in white to represent a ghost. The most important items to bring are extra batteries and entertainment for the three to five-hour bus ride from the nearest available bus stations. If there was ever an event to bring your camera, the Chiang Mai’s Lantern Festival would be it. Thousands of lanterns light up the November sky on the banks of the Peng River. Fireworks, parades, and religious ceremonies also take place at the event. Be sure to bring a light to find your way around after dark and a jacket as it might feel chilly by the water. If you attend the Lopburi Monkey Banquet you are in for a fun, fruit filled festival. Monkeys have a reputation for populating the central temple in Lopburi, but on banquet day, they eat as if they rule over the temple. Roughly 3,000 monkeys help themselves to about 4 tons of yummy treats including fruit, vegetables, and more of the monkeys’ favorites. Be sure to bring a camera, but be careful. The monkeys have a tendency to climb on the visitors, and steal items from their hands or bags. Who can blame them, after all, it is their banquet! When traveling to most places, layering lightweight clothes is a good idea, but in Thailand you may not even need to layer. Stick with lightweight, quick drying clothing as you venture into the tropical weather of this beautiful country. While the locals often wear bright clothing, to pack minimally, lighter neutral colors are the best choice. Light colors reflect sunlight and help cool you off. The neutral colors will also be easy to mix and match to create new outfits. Packing minimally for a whole new country can seem difficult, but a careful selection of clothing can really save you weight, worry, and time. 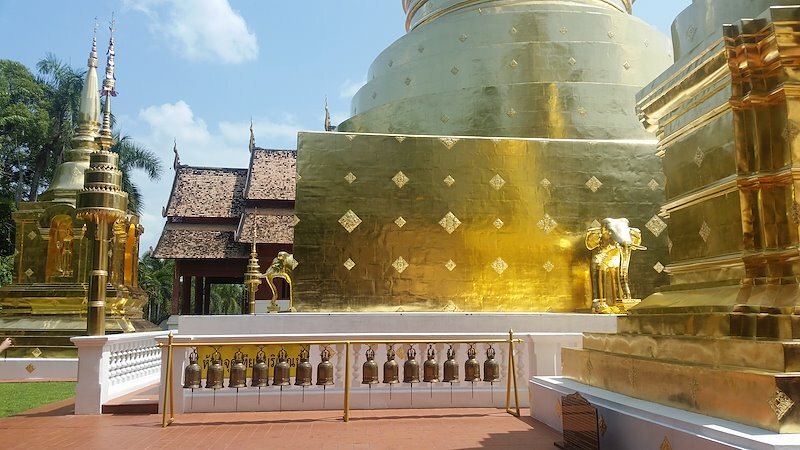 The list below is all you need to enjoy a wonderful experience in Thailand Sandals or Slip-On-Shoes- From the beaches to the streets, sandals will be your friend in the humid climate of Thailand. Hiking Boots- Sandals are the preferred shoes for Thailand, however there are many stunning hiking trails and cities to explore that would be very uncomfortable in sandals. Bring along a comfortable pair of hiking boots to prepare for these excursions. Socks (1 pair per day)- Socks are important on any trip. To prevent blisters on those long hikes, choose wool socks, which wick the moisture from your feet and keep them dry. Bottoms (2)- The best bottoms you can bring are a pair of shorts and a pair of pants to rotate out. Both are most comfortable in a lightweight and breathable material. Women will want to consider bringing a lightweight dress along as well. Shirts (less than 4)- As expected the number of shirts needed will depend on the length of your journey, but to pack minimally you should need no more than 4. There are laundry services around Thailand that offer affordable options to keep you fresh on your trip. For additional comfort bring at least one long sleeved shirt to protect your arms insects, as well as UV rays. Rain Jacket- The tropical climate of Thailand requires a rain jacket to be prepared for the unpredictable weather. Bathing Suit -Luckily for men, many weather-resistant shorts double as swimwear which makes beach days a breeze. For the ladies, a swimsuit is a must. Bring along your favorite one for those relaxing afternoons in Thailand. Sarong- This multiuse item can be used as a coverup, beach towel, bag, and more. It’s a great lightweight article to use during the whole trip. Quick-Drying Towel- Unfortunately large beach towels do not make my minimalist packing list. These towels are just too thick to pack into a backpack. Instead, I use a quick drying towel which will do the job and take up much less room. Toiletries can add up in weight and volume. To keep your pack minimal limit your toiletries to the necessities of sunscreen, wet wipes, Chapstick, deodorant, a bar of soap, toothbrush and toothpaste. With the humidity of Thailand, makeup will have a tendency to run, so going without is the easiest option. Small containers of makeup primer will help if you are determined to make the makeup work. Power Bank- A phone is great to rely on for navigation, communication, or just photos, but you will want to pack an extra power strip for those long travel days. Outlet Adapter- Many outlets in Thailand are the same as Canada and the U.S., however some locations will use the “type C” outlet. Bringing along an adapter will keep you prepared for all situations. Sun Protection- Sunglasses, Hats, and Sunscreen – There is nothing like a bad sunburn to ruin a trip. Stay on top of your sun exposure with the necessary accessories as you will undoubtedly be out in the sun most of your time. Mini First Aid Kit- Accidents happen everywhere. Be prepared for the scrapes, cuts, and bug bites with a travel sized first aid kit. Padlock- Depending on where you stay, it could be helpful to bring along a padlock to secure our items and prevent theft. You really cannot be too careful no matter where you travel. Money belt- Speaking of security, don’t forget to take along your most important documents each day. Storing your passport, money, and other critical items in a money belt will help hide and secure them. Hand sanitizer- Hand sanitizer is a good idea no matter where you are traveling, especially if you meet a local monkey! Filtering Water Bottle- There are many stores that sell bottled water, but if you would like to bring your own bottle, opt for one with a filter to avoid becoming sick from the tap water. Travel Sized Laundry Soap and Floss – If you have space, a travel laundry soap container is a great way to avoid paying to have your clothes cleaned. No washer? No problem. Simply wash your clothes in the bathroom sink where you stay, then use floss to create a clothesline in your room. Chilly Weather Wear- Bringing along a scarf, sweater or cardigan could come in handy. The weather is typically temperate during the day, but the AC on the inside of buildings can be chilly, as are the nights out on the town. Charcoal Tablets or other Stomach Sickness Medicines- When traveling to different countries, there is always a chance the food will not settle well with you. Charcoal and similar medicines such as anti-acids will aid in any stomach sickness that you might come across. Electrolytes- Electrolyte tablets are great to have as refuel after a stomach sickness, or just to energize you during a long day. Travelers often learn from their mistakes and walk away from experiences with wisdom to share. Fortunately, you will not have to worry about your beg because you can perfectly pack for a Thailand adventure using the list provided. All that is left to do is to buy the tickets!